Created by award-winning writers/producers Steven Bochco and Terry Louise Fisher, the critically acclaimed television series LA Law held court in primetime during the course of its eight-season run on network television from 1986 through 1994. Winner of fifteen Primetime Emmy(R) Awards, four Golden Globes(R) and numerous honors and accolades, L.A. Law takes viewers inside the inner sanctum of a fictional Los Angeles law firm of McKenzie, Brackman, Chaney & Kuzak. There, a team of ambitious and competitive attorneys must face the conflicts between their personal desires, their obligations as lawyers, and their principles as human beings. A portrayal of the law and its litigators that was both realistic and irreverent, L.A. Law captivated millions of viewers with its hardboiled drama, rich characters, wry wit and tackled emerging social issues of the time. Season One of L.A. Law boasts an all-star ensemble cast including Harry Hamlin, Susan Dey, Corbin Bernsen, Jill Eikenberry, Alan Rachins, Michele Greene, Jimmy Smits, Michael Tucker, Susan Ruttan and Richard Dysart. Marking 28 years after its initial premiere on network television, Shout! Factory will release LA Law: Season One on February 25, 2014. Season One of the series is available for the first time ever in this 6-DVD set containing all 22 acclaimed episodes, new interviews with series creator Steven Bochco and the cast, including Jimmy Smits, Michael Tucker, Jill Eikenberry, Susan Ruttan and more. 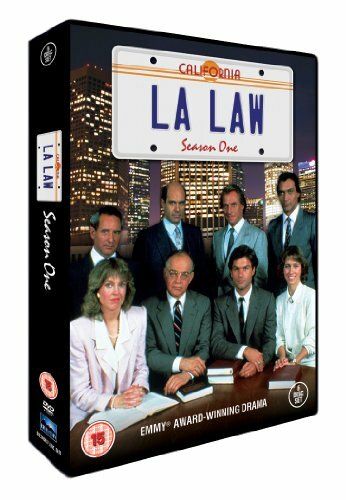 The collectible LA Law: Season One DVD set is priced to own at $29.93 SRP. New Interviews with Steven Bochco, Jimmy Smits, Jill Eikenberry, Michael Tucker, Susan Ruttan and more! The television series L.A. Law is a production of Twentieth Century Fox Television. A 21st Century Fox company, Twentieth Century Fox Television is the flagship studio which leads the industry in supplying award-winning and blockbuster primetime television programming and entertainment content. Led by Chairmen and CEOs Dana Walden and Gary Newman, the studio comprises the production banners Twentieth Century Fox Television, Fox 21, Fox Television Studios, as well as the syndication division Twentieth Television and the worldwide licensing and merchandising division Fox Consumer Products. Founded in 1949, Twentieth Century Fox Television has delivered a wide array of classic television series to audiences worldwide, from M*A*S*H* to Modern Family. Its animated powerhouse The Simpsons, now in its 26th year of production is the longest running primetime scripted series in the history of television.